For example, Jane Austen’s, novels are full of officers serving in the armed forces. Take Persuasion. Apart from the hero Captain Wentworth, three other captains are mentioned, and we meet Admiral Croft as well as two other admirals, one of whom, according to Sir Walter Elliot, has ‘a face the colour of mahogany.’ There is also Mr Elliot’s friend, Colonel Wallis. This number is far in excess of what one would expect to find in 21st century women’s fiction but it echoes the reality of the early 19th century. Eerly 19th century readers would have picked up other information, too. We know that Captain Wentworth is anxious to be back at sea ‘in the year ’06’ after Anne ends their engagement. He is sent to the West Indies – but why? It would have been common knowledge that in 1806 the British navy was eager to take the strategic French West Indian island of Santo Domingo. 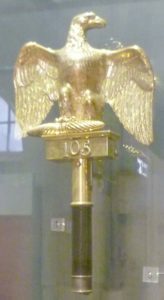 Napoleon’s star was still in the ascendant; on January 1st of that year, he inflicted a crushing defeat on the Austrian and Russian armies at the battle of Austerlitz. It was vital that Britain retained command of the seas, and she also needed the money from the sale of captured enemy ships to help pay for the heavy expenses of ship-building. From a novelist’s point of view, the Royal Navy’s expedition to the West Indies gives Captain Wentworth the opportunity to capture French ‘privateers enough to be very entertaining’ – and earn himself a fortune of £25,000 (a captain was entitled to a 25% share of a ship’s value). This is important to the story. The heroine, Anne Elliot, has social status but her dowry is small –thanks to her spendthrift father. Captain Wentworth needs a fortune to match his talents if he wants to get married. Again, this is a practicality which Jane Austen’s contemporary readers would have understood without it having to be spelt out. Then there’s the militia, a form of National Service which acted as a front line home defence. There were militia camps all along the south coast, which Jane Austen’s readers would have been well aware of. The militia features largely in Pride and Prejudice and we can see why it might be attractive to the cash-strapped and on the make Wickham. 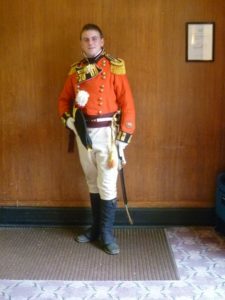 A handsome man, looking dashing in his regimental uniform, can surely find an opportunity for financial advancement – like the rich Miss Mary King. As Mrs Bennet says, ‘There was a time when I liked a red coat very well myself’. 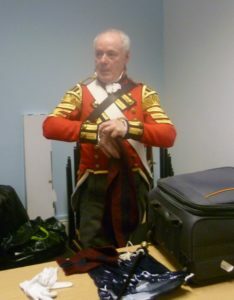 Wickham takes full advantage of his red coat. The fact that the temporary Meryton army camp later moves to Brighton is crucial to the plot, and Brighton, of course, is on the south coast where an enemy invasion might land. Again, Jane Austen doesn’t have to explain it, and, plot-wise, it enables Lydia to go to Brighton with her friend, Harriet, the colonel’s wife, from whence she elopes with Wickham – thus giving Darcy the opportunity to behave as a hero should, and Lizzy to realize how much she loves him. 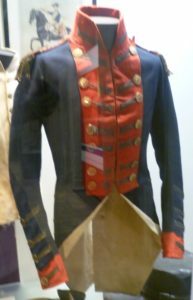 True to reality, the officers become part of Meryton’s social life: ‘The officers of the ­–shire were in general a very creditable, gentleman-like set.’ We meet Captain Carter; Wickham’s friend, Denny; Colonel Forster; Chamberlayne (who Lydia dresses up in women’s clothes for a joke), amongst others. 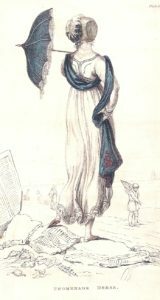 The militia are in Meryton for six months only but they have an important role to play – and the reason for their presence in Brighton on the south coast, facing a possible French invasion fleet, would have been understood by Jane Austen’s first readers. What’s the hurry? Why Spithead? Contemporary readers, of course, would have been aware that Spithead, on the Isle of Wight, provided the best harbourage for ships’ provisioning before setting sail; and that America was eyeing up Canada, a British possession, so an alert navy was vital to protect Britain’s interests. Mr Price’s coarse speech on the naval arrangements at Spithead and the probable westward destination of the Thrush rings absolutely true. We note that the Price family is intimately involved in the war: Second Lieutenant William and Midshipman Sam Price are sailing, probably to America, on the Thrush; and their brother, Midshipman Richard Price is ‘on board an Indiaman’. Fanny has three brothers at risk. 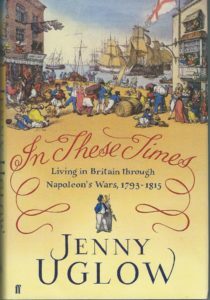 Jane Austen doesn’t need to explain overtly what’s going on in the Napoleonic Wars. Her first readers would have instantly recognized her numerous references to its constant presence. In my view, to accuse her of a narrowness of vision is doing her a grave injustice. Bravo! I have always thought this! It is the things characters take for granted that build the world. That’s what makes the difference between a book which stays with you and one that doesn’t. 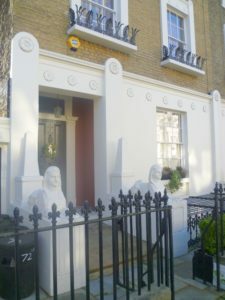 It is my firm belief that reading contemporaneous fiction, newspapers etc – and looking at prints of the time for the throwaway background details – are essential for any writer of historical fiction. Thank you so much for this, Jan – and I love the ‘dull elves’ comment. You are so right about looking at the ephemera of the time: newspapers, cartoons etc. In my view, they are essential research material for historical novelists. So true. If you don’t know the background history you won’t pick these things up. But they are there. As you say, the readers of the time didn’t need telling. Just as modern readers understand digital references, which may not be the case in a hundred years. Thank you for your comment, Elizabeth. I don’t always understand digital references now! And I’m sure that in 100 years, people will need a Dictionary of Historical Words to understand them. As always, a brilliant blog and always so informative. Thank you so much. Thank you, Anne. What made my day was the ‘like’ response to my blog tweet (@Hawksley_E) from Apsley House, once home to the Duke of Wellington! They are now following me, so, naturally, I returned the compliment.